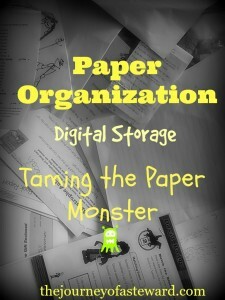 It has been quite a journey trying to tame the paper monster in my home. I really thought paper organization was impossible. But I am finding the small baby steps have been fruitful. It is amazing the freedom that comes with getting rid of so much paper clutter. I did not realize the stress it was causing in my life. I feel that there has been a huge burd en lifted off my shoulders. The next step for us is to permanently get rid of some of the unnecessary things. In this day and age of technology, we have some great options for digital storage. Although trying to figure some of the technology out has caused some stress, I truly believe it will pay off. I have thought through the system I want to create for myself, but I may have to adapt and adjust depending if it is going to work like I expect it to. I have decided to use both Evernote and Dropbox together. Evernote will be used for my daily things much like a “household binder”. Dropbox will be used as my file cabinet. Let’s do this. First steps: You will need to set up accounts with both Evernote.com and Dropbox.com. They both have free accounts. Evernote was a bit more difficult for me to figure out and navigate, but once I did it has been a great tool. This is the book I used to tutor my untechnological self. http://www.amazon.com/gp/product/B00B37H2MI/ref=as_li_tl?ie=UTF8&camp=1789&creative=390957&creativeASIN=B00B37H2MI&linkCode=as2&tag=thejouofaste-20&linkId=B4WVTUFYWB5XNQRM Try not to get overwhelmed. There was a bit of a learning curve for me. I actually set up Evernote some time ago and had to re-familiarize myself on how to use it again. Dropbox, on the other hand, is very user friendly in setting up files. Set the files up just like you would set up a physical file cabinet. I have had a very difficult time letting go of hard copies. I am of that generation of not only, saving my hard copies of everything, but making hard copies of everything as well. This has been something that I have struggled to overcome, however, the results that I have seen have given me a freedom and a huge burden lifted off my mind. We live in such a small space and with the kids only getting bigger, I see the value of digital storing items as much as I can. Although, the learning curve has taken me a lot of time and frustration, it has truly paid off both in time and energy! 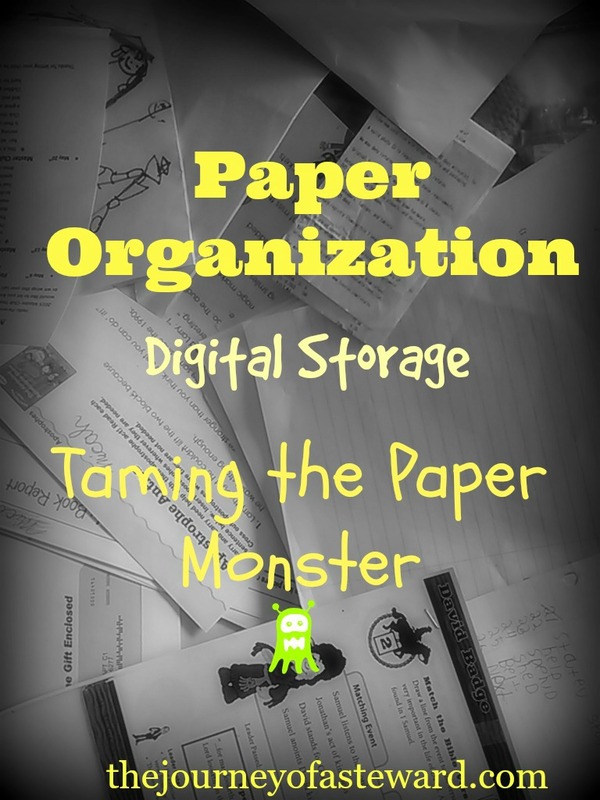 Blessing on your paper organization journey! I would love to hear about your journey and about some of the things you have learned. What works for you? What does not work for you? I would love to hear some of your tips! Kelly is a participant in the Amazon Services LLC Associates Program, an affiliate advertising program designed to provide a means for sites to earn advertising fees by advertising and linking to Amazon.com.